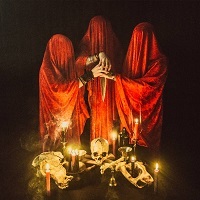 QAYIN REGIS is a new Black Metal trio from Madrid, Spain, formed in 2017. “Blackthorn” is their debut EP, containing three tracks, and clocking in at just under twenty minutes in length. “Niantiel” leads off the EP, with some eerie background screams, before the main riff slams in. The sound is muffled, and dirty. The guitars almost blend together with the bass while the drums keep a steady presence. The vocals are relatively high in nature, but not overly pronounced. The sound is harrowing and evil throughout, until a slight pause just after the half-way mark, then it picks up with renewed hatred. “Sceptre of the Shadow of Death” opens with some great guitar parts, echoing off deep mountains in the pit of Hades. The riff then settles into a commanding sound, as if orders are being given to subjects to start a war on the Earth above. The snarling vocals really keep the song rooted in nefarious elements and malignancy. “Prunus Spinosa Litourgya” is the three-minute closer. Drum beats sound like footsteps and clean guitar warns of something coming. The vocals are spoken at this point. It continues with just that subdued warning as the hairs stand up on the back of your neck, rolling to completion. Three tracks is hard to judge an album on, and especially when one of them is quite short, but I get the sense that the band is really onto something here. They have laid all the foundations for an excellent Black Metal sound. The music is tense, and severe, and the vocals downright scary. It isn’t anything new, but they do it with conviction.